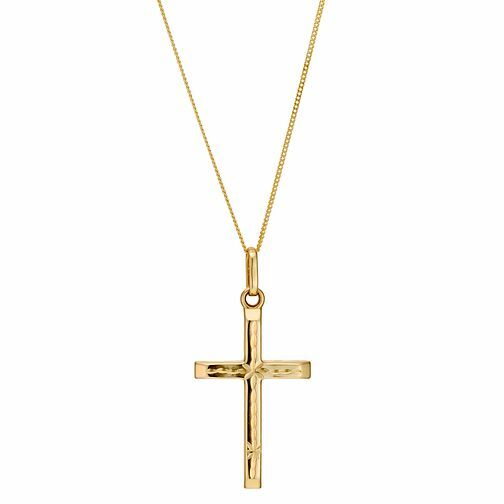 A classic gift for a loved one, or treat for yourself, this cross pendant is crafted in 9ct yellow gold. 16"
9ct Yellow Gold Cross Pendant is rated 4.6 out of 5 by 7. Rated 3 out of 5 by Anonymous from Not what was expected The chain is ridiculously thin as well as small. The pendant is good quality, but also small. I bought it as a gift and additionally bought the gift packaging, that includes a personal message; this was also underwhelming as it was a plain sticker with tiny text. Rated 5 out of 5 by Anonymous from Perfect little gift for someone special :) I purchased this lovely necklace for my mum as one of her 60th birthday presents and she really loved it. It’s a good size with a delicate chain, but the engraving on the cross is what makes it. It reflects the light and looks really pretty. Very happy with this buy.